The racing career of the most complete thoroughbred the world has ever seen commenced on September 20, 1976. 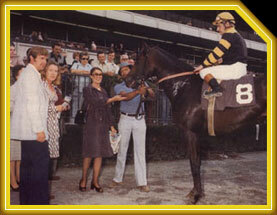 Seattle Slew, a big, strong, nearly-black two-year old colt by Bold Reasoning out of the stakes-winning mare My Charmer would compete in a Maiden Special Weight six-furlong event, the fifth race at Belmont Park in New York that day. Most of the general racing public were unaware of the magnitude of greatness that would be ignited this day. This quiet Monday afternoon at the close of America's Bicentennial summer celebration of independence would officially begin a championship legacy that would last into the 21st Century and beyond. The collective racing fraternity didn't know much about Seattle Slew before this day. They were unaware that Karen and Mickey Taylor of White Swan, Washington owned him. Most were seemingly unaware that the colt had blazed six-furlongs in 1:10 1/5 during a mid-August workout on Saratoga's main dirt track. Or that he had worked five furlongs in :58 2/5 on swampy grass at Saratoga's Oklahoma training track on August 11. The speed and quality of these workouts were highly exceptional for a maiden two-year old. For some reason, however, they were never accurately entered in the Daily Racing Form. The September 20th morning-line odds on Seattle Slew were 10 to 1, and none of the six Racing Form selectors had picked him to win. In retrospect, we can surmise that this was the case because the aforementioned workouts were unavailable in the publication and the field of competition that Seattle Slew would face was packed with high-priced promise. Indeed, the field included well-bred colts by such respected sires as Damascus, In Reality, Never Bend, Graustark, and First Landing. First-time starter Winaben, trained by Reggie Cornell, had been breaking stopwatches in morning workouts. Two of the licensed tip sheets sold at Belmont that day had Caribert, a gelded son of Roi Dagobert, as their "best bet" of the day. Four others also had Caribert on top. One other touted Proud Arion as its "most preferred" play of the day, while another chose Winaben. None had selected Seattle Slew. It seems, however, that some members of the wagering public knew more than what the Racing Form and licensed tip sheets were letting on. The first flash of odds that reflected the money bet by the public at the track and at more than two hundred Off-Track Betting shops in the New York area made Seattle Slew the 7-5 favorite. The odds gradually lengthened, first to 8 to 5, then 9 to 5, then 2 to 1. As the horses were loaded into the starting gate on the distant backstretch of the mile-and-a-half track, the odds settled on Seattle Slew as the favorite at 5 to 2. In the paddock area and during the post parade, Seattle Slew's competition and the world received its first dose of his "War Dance", the prancing, on tiptoe dancing that would always be a uniquely recognizable and intimidating part of his pre-race routine. Breaking from the eighth slot in a field of twelve, Seattle Slew broke slowly and was quickly trailing nine other colts. But he soon displayed his fluent stride and natural speed and captured the lead, by a half-length, after a quarter-mile in :22 2/5. He widened the lead to two lengths after a half-mile in :45 2/5. He quickly widened that advantage to five lengths, a margin he would maintain to the finish line in a time of 1:10 1/5, an effort the Daily Racing Form described as "easily." Proud Arion, Prince Andrew, and Caribert followed him home. Winaben would finish seventh. As would be the case in many confrontations to come, Seattle Slew had stamped his intimidating presence into the physical and mental world of his competition.